Will is from a farming background and he went to the Shuttleworth Agricultural College after leaving school. Completing his studies at college, over thirty years ago, he then travelled overland visiting other parts of the world before finding his 'Karma'. A place to farm in a way he thought everyone should be able to farm - in harmony with nature rather than trying to defeat it. Will says, 'Karma Farm is just twenty-two acres but we rent a few more acres as summer grazing for our beef cattle. 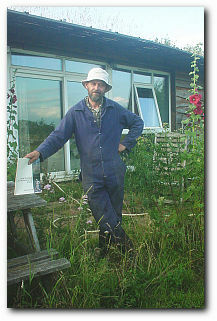 In 1995 we built ourselves an earth-sheltered home with the help of our friend, the local architect, Graham Waterhouse. We all found extra extra help and advice from the book, 'How to build and underground house' by Malcome Wells, an American pioneer of earth-sheltered technology. Earth sheltered homes are carbon-neutral and could even be 'positive' if materials such as hemp are used in the construction, with lime mortar used to build the floors and walls. An earth-sheltered house doesn't need to be expensive to be very good!